"Sampath Speaking" - the thoughts of an Insurer from Thiruvallikkeni: Bumrah special ~ double standard when Kapil was criticised for same !! Bumrah special ~ double standard when Kapil was criticised for same !! If one were to remember those few matches, even today one would get a bit sorrowful .. .. a bright afternoon, when whole Nation sat before TV wanting India to clinch a Gold in their favourite game. Web search reveals that Tamil Nadu’s Chief Minister MGR had come in early. Rajiv Gandhi and Buta Singh too were there as tension gripped the stadium. Prime Minister Indira Gandhi was the chief guest. Asiad at New Delhi ~ India lost to Pak and Mir Ranjan Negi looked the villain letting 7 goals. Way back in 1950, Brazil's goal –keeper Moacir Barbosa, was villainised by fans for the host nation's unexpected defeat against Uruguay in the final of WC football. Then in Sharjan in 1986, Chetan Sharma bowled a full toss, to be swatted by the centurion Javed Miandad, for a six, changing the fortunes and haunting India for many years to come. An year and little later, Chetan Sharma took a hat-trick in a World Cup match in Nagpur against New Zealand. An eight over match, to me, is a farce – too little - for a game to happen – and that was the decider T20 3 at Thiruvananthapuram, where it rained heavily. India did post an ordinary looking 68 as target. Indian bowlers backed up by some good fielding did the trick. After over 6 NZ were 39/4 requiring 29 off 12, gettable in modern day standards. 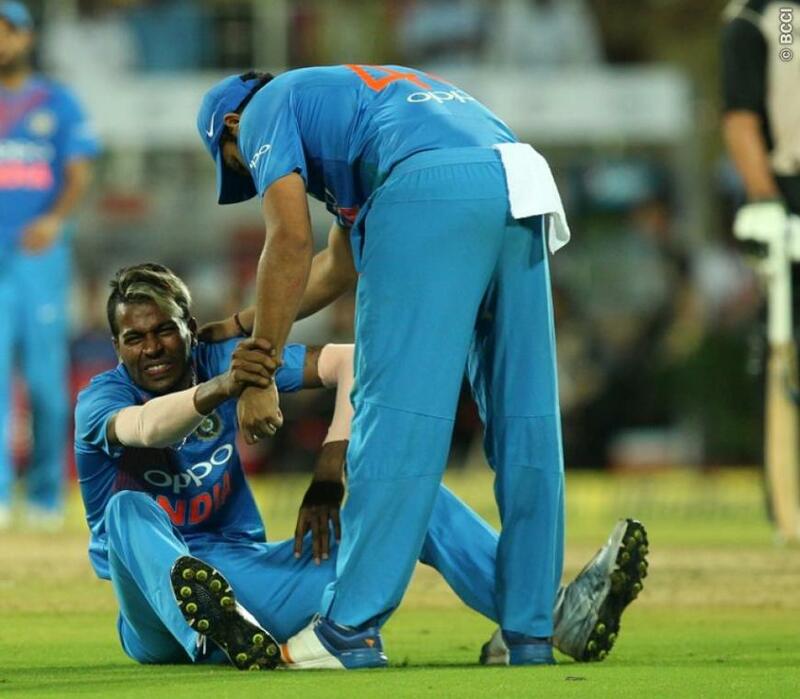 The last over was bowled by the mercurial Hardik Pandya who stopped a full blooded shot in his return in the 2nd ball, hurt his finger very badly and as he writhed in pain, for a moment everyone was worried as to who would bowl the remaining 4 balls. He heroically did and India won .. but the over before that perhaps sealed the fate. Indian skipper Virat Kohli reaped the benefits of some impressive selection in terms of bowling order which included making Bhuvneshwar Kumar bowl his quota of two overs up-front. In the climax, Jasprit Bumrah's 2nd being the penultimate over had the magic impact. Virat Kohli revealed that it was the idea of Rohit Sharma and MS Dhoni to hold Bumrah until the 7th over. India beat New Zealand by six runs in the rain-curtailed match to claim the series 2-1. India had beaten the Kiwis in ODIs with the same scoreline. Jasprit Bumrah starred with the ball, striking twice and bowling the all-important penultimate over of the game. He ended with figures of two for nine in two overs and was deservedly named Man of the Match and Player of the Series. So bringing Bumrah to bowl the penultimate over was the brainy decision ~ just hold back to read, what exactly critics wrote of a similar situation, the one in Sharjah 1986 – poor Kapil Dev was the captain. Around 16 were required off last two, Kapil came on to bowl the 49th (his 10th ) – controlled things giving away only 5 runs, Chetan bowled the last over when 11 were required and off the last ball Javed Miandad hit a six of a full toss making it a night mare for Chetan, Kapil and Indians. The Press seethed with anger on Kapil and Rajan Bala wrote ‘Kapil in need of Maths tuition’. Gross injustice – if only Chetan had bowled the penultimate perhaps the last over would have been a simple affair with Pak needing something less than 6 or perhaps there would not have been need for one. Kapil was always a sitting target; anyway history cannot be rewritten by ‘ifs and butts’ ~ and today, Virat Kohli opted for Bumrah, it is hailed as master stroke. For the old timers, Krish Srikkanth made 75; Sunil Gavaskar 92, Dilip Vengsarkar 50; Kirti Azad repeated his WC final score (0) Shastri made 1 – Chadrakant Pandit was the wicket keeper batsman as India posted 245/7 in 50 overs, a good score those days and the match culminated with the last ball.